Place olive oil in a medium skillet on medium-high heat. Carefully place one tortilla into the skillet and fold over one side onto a spatula to form a taco shell. Fry tortilla for about 2-3 minutes or until golden brown and turn to fry other side. Continue to hold the other side of tortilla with spatula so that it does not fold over on itself. When golden brown, remove from heat and place upside down on paper towel lined plate to drain excess oil. Repeat with remaining tortillas. Fill taco shells with 2-3 tablespoons of shredded chicken, lettuce, tomato and cheese. You can also use shredded turkey or beef. Add some pickled jalapeños or salsa to spice it up. To me, one of the best purchases made in a grocery store is a rotisserie chicken. There are endless meal possibilities you can prepare with a whole chicken that is already roasted to perfection for you. 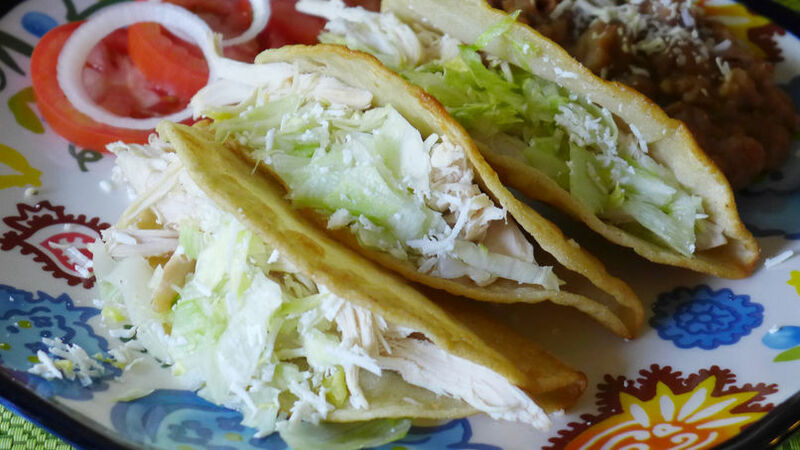 One of my favorite ways to incorporate rotisserie chicken is stuffing it in fried tortilla shells as tacos dorados. Your family will love this hearty dinner, and you will love how easy and quick it can be prepared. Top these tacos with your favorite greens and spicy salsa and your dinner will be one of the most popular meals on your weekly menu!